It is with regret that we have to announce that Hugh Dokter, our head coach, has given notice to leave the club at the end of his current contract. Hugh has decided to take the head coach role at Dane Valley Swimming Club in his home town of Congleton, which with less travelling allows him more time to work on building his non-swimming business. Hugh will continue to coach until the end of February. and the committee are now working very hard to find a replacement as soon as possible. We have a team of very capable coaches in Dave, Liam and Matt who will be continuing to build on what Hugh has started. The positive influence Hugh has had on the squads has been evident to everyone so we thank him for that and for his part in reshaping the club. We ask that all parents and swimmers take a moment to look through the clubs new squad structure going forward. The only main change that has happened is on a Tuesday. If you have any issues please contact the club. Buxton Swimming Club’s final open meet of 2015 will be at Chesterfield for their Winter Championships. All swimmers are welcome to join in. Closing Date is TOMORROW night immediately after the Club Championships. Please find attached the results from Friday nights Club Championships. The Club Championships continue this Sunday! Please find attatched Buxton Swimming and Fitness Centre October Half Term Programme. Including a special Splash Hour with the pool dyed RED! This is a bookable session. Wood a Leading Contender for Sportswomen! THE board above the Stockport Metro pool is emblazoned with the names of club swimmers, several of whom are Olympic medallists. They include Graeme Smith, Steve Parry, Cassie Patten and Keri-Anne Payne. One of the newest names is Holly Hibbott: her performances this year and those of her friend, Abbie Wood, make both girls leading contenders in the Young Sportswoman category of the Sunday Times and Sky Sports Sportswomen of the Year Awards, in association with Vitality. Although aged only 15 and so two years below the junior age limit, Hibbott took the 2015 European title and finished third in the world championships over 800m freestyle. However, it is not just her performances that impress Sean Kelly, the head coach at Stockport’s Intensive Training Centre. He says that Hibbott shares “the same characteristics of a champion” of so many of the outstanding competitors he has guided. “We had seen Holly swim in races for a number of years. The talent was obvious but what I did not realise until she came here was how hard she works,” Kelly says. “She comes across as a friendly, lovely girl with a sense of humour but there is a real steel about her. Often she will win races over the last 5m, even the last stroke. After finishing second in the 2014 European junior championships in Dordrecht, Holland, Hibbott has improved immensely this year. She clocked 8min 39.02sec to take the 2015 title in Baku, Azerbaijan, in June and then 8min 31.56sec in the world junior championships in Singapore, a time that ranked her third in Britain as a senior. Looking ahead to the Olympic Games, Kelly claims: “You’d be an idiot to say that she has not got an opportunity to be a possible for Rio next year.” Training is gradually being increased this winter — she often swims 70,000m a week already — but next summer is also when she will take at least five more GCSE exams, having already passed science and PE a year early. With the Olympic trials in April, managing her time will not be easy. Some of her sessions are in Southport, where Mark Patrickson coaches her in consultation with Kelly. Occasionally, Hibbott trains alone in the 25m tank that her father bought after it was used in Manchester at the 2008 world short-course championships. He has installed it next to his swimming school. Abbie Wood occasionally stays with Holly so that they can train together. Otherwise, they keep in touch through Facebook and text messages, as Wood, who also won a European junior title this year, is based at the Intensive Training Centre at Loughborough. Abbie lives in a “sports elite” house of eight girls and nine boys and fits her training schedule around studying for a sport and exercise level-three qualification at Loughborough College. 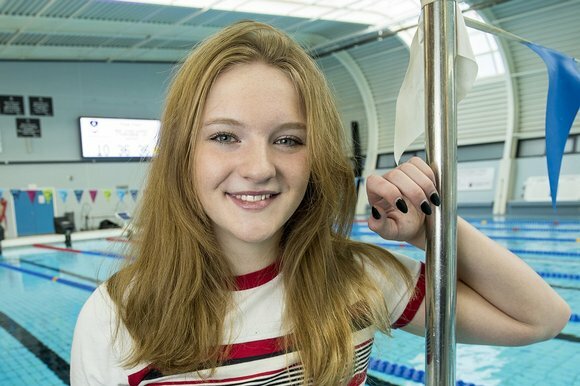 Wood, 16, whose home is in Buxton, Derbyshire, won four medals at this year’s European junior championships, including gold in the 400m individual medley in 4min 41.97sec. She took a 1.79sec lead on the opening 100m butterfly, only to trail by 1.90sec in third place after the second leg on backstroke. She then recovered the lead on breaststroke, eventually winning by 3.04sec after the 100m on freestyle. The Derbyshire LC meet is going to be held on Sunday 6th December 2015 at Ponds Forge! No category 2 membership is needed so we would like as many swimmers taking part as possible. 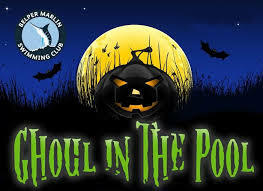 We are pleased to announce our first open meet of the season will be held at Matlock as we take part in Belper’s Ghoul in the Pool. This is the first competition that our new head coach, Hugh, will get to see our club in action and what swimmers need to work on. All swimmers and parents are now to discuss all race selections with their coaches before submitting any form. Lets start as we mean to go on! Buxton Swimming Club are pleased to announce the appointment of Hugh Dokter as the new Head Coach. Hugh, from Congleton, swam from the age of 8 for home club Dane Valley. Hugh experienced all levels of competitive swimming from county through to masters. Hugh also comes with an excellent background in coaching swimming. Hugh started off as an assistant coach for his home town club Congleton where he coached swimmers from junior through to age group. After a short spell, Hugh moved to Satellites as an assistant coach where he became head coach. Hugh was to return to Dane Valley some time later as Head Coach where he produced the clubs first national swimmer for over 10 years and was responsible for the overseen of the learn to swim programme and national swimmers. In 2007, Hugh moved to New Zealand taking over Otumoetai Swimming Club as head coach where he developed the club and made 50% of swimmers compete at the NZ Nationals. Again overlooking the learn to swim programme and produced the clubs first ever representative for New Zealand. In 2009, Hugh set up his own swimming club in New Zealand for a summer season. Whist in New Zealand, Hugh went to 1 other club. In the early years of 2011, Hugh took over the Cooks Island national team and took the to the London 2012 Olympic Games (pool only) and the Shanghai FINA World Championship (in both open water and pool). Whist been in charge of the Cooks Island, Hugh took over North Wales club Wrexham for a short spell before moving to Lincoln Vulcans overseen both competitive swimming and learn to swim programmes. In 2014 Hugh was appointed a stand in performance coach at Wolverhampton Royal School which included swimmers representing Team GB and part of the English Talent Programmes. Hugh is currently interim Head Coach at Richmond Dales where he transformed swimming squads, placed swimmers onto the English Talent Programme and podium potential para swimmers. We would like to welcome Hugh and wish him the best here at Buxton.